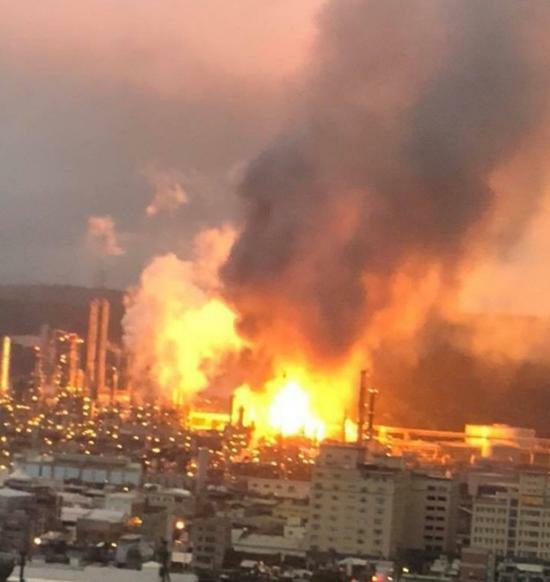 TAIPEI, Jan. 29 (Xinhua) — An explosion occurred at an oil refinery in the city of Taoyuan at 6:42 a.m. Monday. More than 40 fire engines were sent to the scene. The fire has been brought under control and no casualties have been reported. Nearby residents said they heard multiple huge explosions. The shock was comparable to an earthquake, they said. Initial investigation showed the explosion was caused by a pipe rupture at the refinery. The company restarted its refining equipment early Monday morning after annual maintenance, when the blast happened, according to the petrochemical company. Three schools around the factory were suspended on Monday. The explosion will not have a large impact on air quality thanks to wind and rain, the environmental department said. Covering an area of 460 hectares, the refinery is surrounded by residential buildings inhabited by hundreds of thousands of people. Since it was put into operation in the 1970s, a series of accidents have happened at the factory, including two serious explosions in 1997 and 2003. The latest explosion triggered strong protests from local residents, who demanded the refinery be moved as it poses a high safety risk in the densely populated area.